We can’t all possess an in-depth knowledge of the contemporary German comedy and satire scene, but judging by the reaction of some people when told comedy duo Badesalz are making another film (“Wow!” and “Hey!” and “Cool!”), their fifth filmed outing will be yet another nail in that hoary old coffin that Germans have no sense of humor. 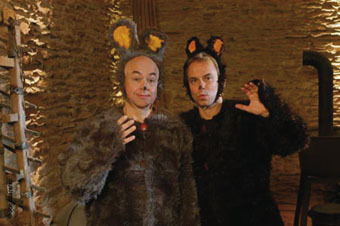 Hailing from Hessen and performing in the local dialect, Hessian, Henni Nachtsheim and Gerd Knebel, also known as “Badesalz” (which translates as “bathing salts”), specialize in a black, very typically English kind of humor. Think droll and sardonic. Monty Python-ish. They are, to use a phrase, Big In Germany! Das Baby mit dem Goldzahn, which has seen previous outings as a CD and a play, tells the madcap story of a future Germany under the thumb of an evil dictator determined to ratchet down the IQ of his moronic subjects (a drought having previously shrunk everyone’s brains) even further. To this end, universities are turned into tattoo-studios and, so that nobody has anything intellectual to think about whatsoever, he bans that uniquely German form of popular music, “Schlager”. It is up to our two heroes or, rather, the twenty or so characters they play, together with a little girl (played by Olaf Mill), to find the legendary “Baby with the Golden Tooth” and, all together now, save the world. Director Daniel Acht wrote and helmed, together with Badesalz, Dark Ages. That won, among others, the Short Film Award of the Friedrich Wilhelm Murnau Foundation. And director of photography Roland Willaert has worked with the duo since 1995. Huerth-based mementoFilm was founded in 2005. But in a previous life and form, the producers made award-winning films such as Der Anwalt und sein Gast (German Television Awards 2001 for Best Direction, Best Music, Best Photography as well as being nominated for Best Editing and Best Supporting Actress), while their Schoene Frauen won the Audience Award at the 2005 Emden film festival.